Dosmoche festival is joyously celebrated with great zeal. This annual festival was started by the royals of Ladakh, as an exemplary of the popular Monlam Prayer Festival. During this festival, there is a popular traditional dance like sacred mask dance. 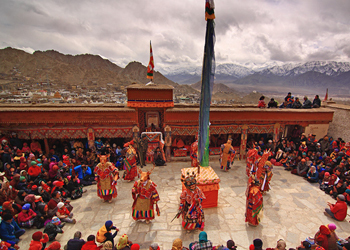 The dance is a thrilling act, a drama and it is carried out in the courtyard of the old chapel below Leh Palace. On this time of the festival, you can see many noted Lamas coming to attend from different monasteries across Ladakh. The significance of Dosmoche festival is to eradicate the evil. And the people actively participate in the rituals that have been followed since ages. During the festival, there are specific timings for certain rituals and idols are prepared of dough. In the ceremony, the idols are burnt or kept isolated in solitary. By doing so, it is believed that the evil spirits of the old year dwells around the idol or waft with them. Thus, the town gets ready to welcome the New Year wearing their Ladakhi traditional customs and musicians play religious orchestra throughout the two day celebration. Generally, this festival falls between November and March. And the main highlights are the decorations of the Leh Palace, alluring music of the drums, masked dance that show drama and the unique rituals performed by the lamas.